1991 Topps Baseball saw the company celebrate it's 40th anniversary. Although it's not one of the card maker's most valuable releases, it's one of their most attractive. 1991 Topps Baseball sticks with a then-standard 792-card checklist. There is plenty of room for all the game's top stars. Many of the rookies come from the Draft Picks subset, the best of which is Chipper Jones. Other subsets include All-Stars and Record Breakers. The base card design is very clean and highlights the stellar photography. Cards have a white border. A pair of thin frames are also around the photo. These frames are color-coded according to the team. A bar runs along the bottom of the card has both the player name and position. Above the bar is a ribbon with the team's name. Topps used a special 40th Anniversary logo on the cards. Card backs are red with complete career stats and player vitals. A short bio is added for those players with enough space. 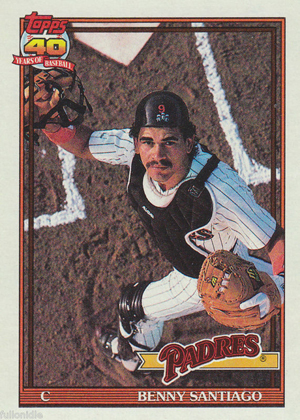 For whatever reason, 1991 Topps Baseball has an abnormal amount of errors. Most are statistical errors, but some players have the wrong photo or wrong team. A complete list of errors and corrected versions can be viewed here. As part of the 40th Anniversary celebrations, Topps included buybacks and buyback redemptions for Topps Baseball cards released between 1952 and 1990. One collector was also given a complete run of base sets from each year. 22 cards. Inserted one per rack pack. 33 cards. Inserted one per jumbo cello pack of 100 cards. The link provided for a “complete list of errors” does not lead to a complete list, rather, just the beckett-listed errors. There are many, many more for this set. 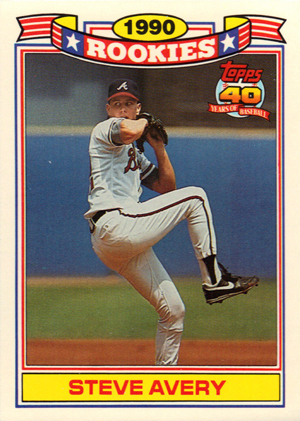 A google search will provide more thorough lists for 1991 Topps variations. Not my absolute favorite set of all time, but still an excellent product. Love that Benny Santiago card you guys posted in the checklist page. That is probably the most fantastic shot of all time. I have 6 of those cards, and two of them in mint condition, and the other 4 near mint. One of better sets Topps produced. This was the year Topps finally woke up and decided to try to put out a set to try to compete with Upper Deck. While they still fell short this set had great photography and design and was clearly one of Topps better sets in the Junk wax era. 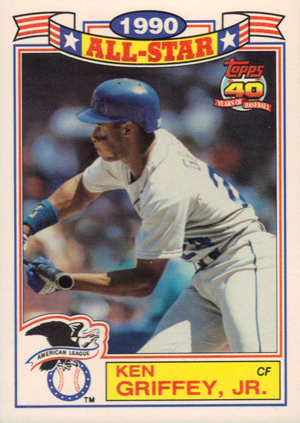 Compared to the ugly 1990 Topps design this was leap years ahead. 4 stars because it took me a few times to get to my site.